That striking matches sound you just heard was every Dolphins fan trying to burn their Dan Marino jerseys in tandem. I know it's been bad for the Dolphins, but, Quincy Carter bad? 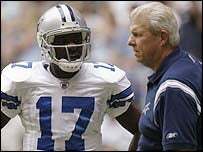 You'll recall that Carter played for Parcells at Dallas in 2004. Before heading to the Jets for three games and then failing in both the CFL and the Arena Football League 2 (yeah, the junior division). Supposedly Quincy will be trying out on Friday. Yes, exactly, just what Dolphins fans want, someone who compares himself to Ricky Williams and has never issued a correct audible in his entire football career. John Beck and Chad Henne must be looking awesome in camp. Where oh where have you gone Jay Fiedler? Dolphins QB race reaches nadir: Quincy Carter coming in for a tryout?